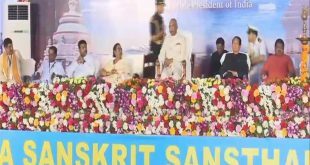 Bhubaneswar: President Ram Nath Kovind on Sunday said IITians should aspire to achieve the best not only for themselves but also for society and the nation and world at large. “Being bright technocrats, I am sure that many of you would consider setting up your own ventures to give shape to your innovative ideas. 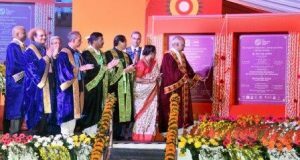 In doing so, avail the benefits of Government of India schemes that encourage innovation and entrepreneurship,” said the President while addressing the sixth convocation of IIT Bhubaneswar here. “For a young IIT like yours, there are several challenges to be overcome. What matters though is the road map that you envisage for your institute. You should aspire to be the best in all areas, be it teaching, research, social impact or infrastructure,” he added. 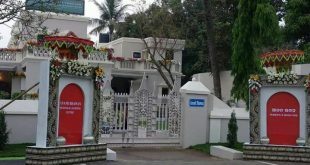 The President expressed his happiness as IIT Bhubaneswar has carried out several sponsored and consultancy projects and has set up five Centres of Excellence including the Bay of Bengal Coastal Observatory. 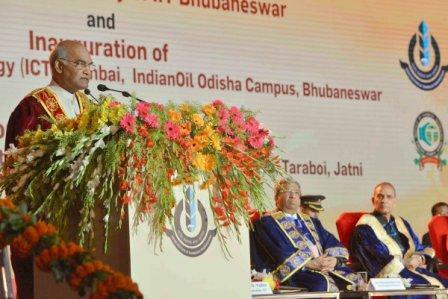 During the convocation of IIT Bhubaneswar, President Kovind inaugurated the Institute of Chemical Technology –Indian Oil Corporation Bhubaneswar campus. He also laid the foundation stone for the Skill Development Institute of Oil PSUs at IIT Bhubaneswar. The ICT- IOC campus will be fully equipped for carrying out high-class research and innovation at Centres of Excellence to develop technology and to support R&D in industry & skills development in Chemical Engineering, Petrochemicals, Textiles, Polymers, and Pharmaceuticals & Energy. 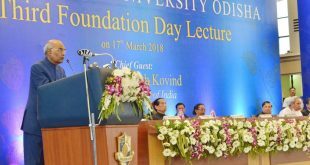 Odisha needs extensive and innovative inputs from institutes like ICT-IOC Centre, besides mother plants like Indian Oil’s Paradip Refinery, said Union Petroleum Minister Dharmendra Pradhan.